Toronto, Ontario--(Newsfile Corp. - February 11, 2019) - Relay Medical Corp. (CSE: RELA) (OTCQB: RYMDF) (FSE: EIY2) ("Relay" or the "Company"), an engine of MedTech innovation, is pleased to report on development activities and hardware design on the Pharmatrac medication management technology. 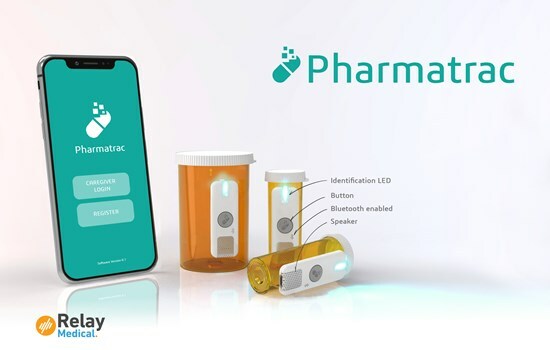 Following the completion of the first Relay led Pharmatrac user study, the Company is pleased to present the Pharmatrac's digital label hardware design. In November 2018 the Company announced the commencement of the Relay led Pharmatrac user study to assist in the evolving design of the medication management system. The user study protocols were designed and conducted with the assistance of Human Factors North to assist with the designing of a smart system to accurately address the needs of patients and their care circle while compiling data to improve prescription management and influence patient habits. The Pharmatrac digital label hardware design has been designed to affix to standard sized medication/pill bottles via both reusable and tamperproof methods. The Digital Label includes Bluetooth and proprietary connectivity channels, a high-quality speaker, patient engagement button, identification LED, and several sensors, packaged in a small tamperproof form factor with onboard power management and memory cache. The Digital Label is designed to communicate seamlessly with the hardware and software apps in the current product release pipeline, to create a comprehensive suite of products and services to cater to the needs of patients and care givers. The hardware and apps will enhance and simplify medication management for both patient and caregiver, as well as gathering rich data for the patient/caregiver and for the Providers and Payors. The cloud-based AI, analytics and predictive algorithms will provide unprecedented value to all stakeholders. "Medication adherence is a complex issue which is reflected in our design, business, and go to market strategy. As the consumer-facing component, the Pharmatrac Digital Label has been designed to offer users a frictionless, smart solution to address the multifaceted challenges of safe and consistent medication use," said Lahav Gil, CEO, Relay Medical Corp. "Our philosophy has been to develop a system that addresses the needs of all of the most critical stakeholders within the prescription environment, and we believe that this complete-solution approach has the potential to play a significant role in solving this multi billion dollar problem." The Company is currently preparing for the next two user studies to test out its most advanced concepts for user experience and technology integration. The team continues to design the business architecture, which includes pricing strategies, integration with existing smart-speakers and smart home systems, like Amazon Alexa and Google Home, as well as the recurring revenue stream strategies for the subscription service offerings to the users and institutional stakeholders. The consumer device launch is part of a path to market strategy that enables the Pharmatrac to be integrated with the dispensing process at the pharmacy. Medication non-adherence is a world-wide problem that costs payors and healthcare systems billions of dollars annually and puts consumers at significant risk. There is a growing need for assistance in the management of medications and for information related to adherence to improve efficiencies in the pharmaceutical ecosystem. In the United States it is estimated that over 20% of Americans are on 5 or more pharmaceuticals(1), an expenditure of US $250B per annum(2) for prescription drugs. Individuals have a difficult time managing their medications which results in un-necessary hospital admissions (33%-69%)(3) and readmissions within 30 days due to adherence issues (~64%)(4). In North America it is estimated that patient compliance and medication adherence is less than 50%(5) which means more than half of patients/consumers are likely to improperly take or skip medications, appointments, and other treatment protocols. 125,000 unnecessary deaths are estimated to occur every year in the US due to this issue(6) and adds an estimated US $290B to the US healthcare system(7). The Pharmatrac is a UX-centric (user experience) system designed to improve management and identification of medications. The system offers sophisticated smart solutions to patients, caregivers and other stakeholders in the pharmaceutical prescription lifecycle. The initial stage of commercialization will be the launch of the 1st generation consumer product that consists of a suite of interactive trackers and apps being developed to connect with an AI-driven analytics platform, enabled by IBM BlueMix, IBM Watson, and other SaaS modules. The consumer product is being designed to integrate with current and evolving smart home systems and enables consumers and caregivers to confidently identify, track, and monitor medications by utilizing audio labels, sensors, cloud, AI and Bluetooth technology, to influence user habits. The 1st generation Pharmatrac is planned for commercial launch in 2020. Relay Medical is an evolving "Integrated MedTech Accelerator" headquartered in Toronto, Canada, acquiring early-stage technologies and inventions, advancing and preparing them for pre-commercial acquisitions in the HealthTech marketplace. By integrating the funding, development and exit process into one organization led and managed by one expert team, Relay Medical is building the capacity to accelerate and transact technologies with high efficiency and grow into a leading engine for MedTech innovation in the global HealthTech marketplace.